Learning Goal: I will explore the main causes of WWI and examine who was most prepared for a war. Action: Use your text book (pg 64-68) to fill in the blanks on your place mat. Watch how the Black Hand plot played out. Learning Goal: I will plot out the Domino Effect and examine the Schlieffen Plan. Learning Goal: I will further examine the results of the Schlieffen Plan and investigate Canada's reaction to being part of the War. Consolidation: What would you have done? Who was to blame for starting the War? 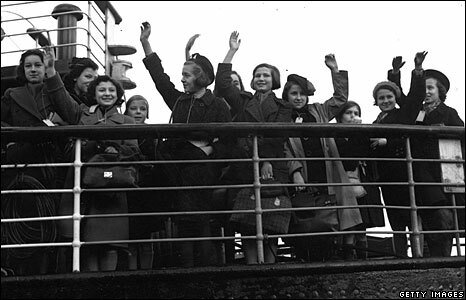 It Happened on This Day: 1938: The first Jewish refugee children from Nazi Germany arrive in Britain on the 'Kindertransport'. 1945 - The Allied bombing of Dresden, Germany, kills at least 25,000 people, causing a public outcry in Britain. Learning Goal: I will investigate how First Nations soldiers were treated during World War I and learn how they accomplished remarkable feats. Minds On: Canadians and the beginning of War. Consolidation: Reflection - What do you think life was like for the First Nations soldiers who were lucky enough to return home? Learning Goal: I will explore what life was like in trenches and try to imagine what daily life was like for soldiers living in such horrible conditions. Action: Lesson - What did soldiers face in the trenches and how did they cope? Consolidation - We will begin to create our Grand Map on the wall! Action: Complete your Trench Attack plan and share with the class. Consolidation: Who won? Discuss Over the Top strategies and the likelihood of success. What are problems soldiers face that we have not yet discussed? Minds On: Reading - Three Day Road (20 mins.) Today you need to read through the entire booklet. If you were away yesterday, or left for the early bus, there are extra copies of the assignment on the shelf where the extra text books are! Work on the Pre-Reading page. Copy this into your notes! Consolidation: Read and complete the assigned pages and questions. The supply teacher will give these to you. I will check to make sure you have completed these when I am back on Friday!!! Learning Goal: I will continue to examine what life was like for soldiers while examining the Battle of the Somme and exploring problems soldiers faced. Friday, 21st - SNOW DAY! Enjoy your Weekend! Learning Goal:I will continue to examine what life was like for soldiers while examining the Battle of Vimy Ridge and exploring obstacles Canadian soldiers faced. Finish watching the video from last week. Play Ninja, if time permits! Learning Goal: I will continue to examine what life was like for soldiers while examining the Battle of Passchendaele and exploring what obstacles Canadian soldiers faced. Learning Goal: I will analyze military technological advancements accomplished in WWI and how these advancements contributed to the outcome of the War. Action: Discussion - What impact does war have on technology? Consolidation: Three Day Road work time. You will have the entire period to complete your test! Should you finish early, you should work on your Three Day Road project! You will have the period in computer lab #225. It is crucial that you have the three chapters read and all ten of your words ready! It would also help if you have brainstormed and made note of what you would like to include in Part B. Learning Goal: I will define propaganda and examine how it was used to shape and influence the minds of those involved in WWI. Minds On: What is Propaganda? Action: Examine examples of propaganda from WWI and complete an analysis on the purpose of using propaganda. Consolidation: Begin creation of your own propaganda poster! First you must complete the outline to ensure your poster has a message and targeted audience!. When you finish, you may use the remainder of class to work on your letter. Learning Goal: I will consolidate my understanding of the WWI unit by creating a propaganda poster. Consolidation: Act on descriptive feedback provided. Monday, 17th - Welcome Back! Learning Goal: I will examine the factors effecting the ending of WWI and begin to predict the fate of Canadians after the War. You will have today's class to work on your propaganda posters! Remember, these are due Friday!